Creating a healthy home has been a priority of ours since we began our renovations five years ago. Our motivation was due, in part, to the fact that this was a home in which we hoped to raise children. So naturally, creating the healthiest nursery possible was also main priority for us. It motivated all of our choices, from furniture and wall treatments, down to the rug. The Cribs: We chose the Da Vinci Jenny Lind crib because it is made with wood harvested from sustainably-managed forests. It's also lead and phthalate free, and stained in a non-toxic finish. Also, the teething rail is BPA free. The Crib Mattresses: We chose Naturepedic organic mattresses. They offer a non-toxic waterproof surface that includes 100% food-grade polyethylene. They are also hypoallergenic, filled with organic cotton filling. 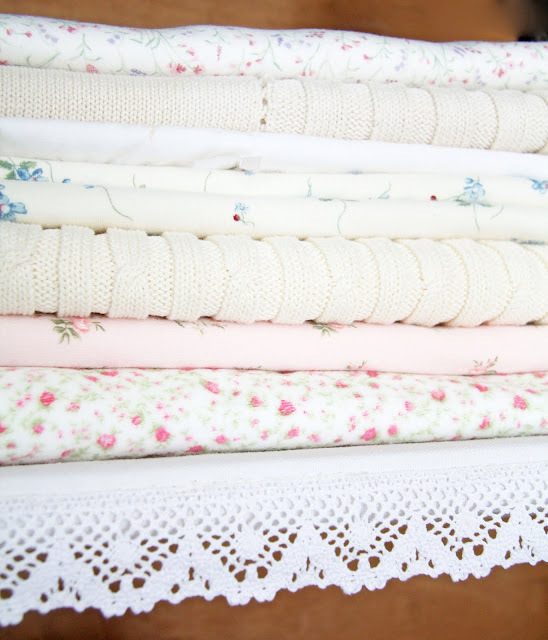 The Crib Sheets: We chose 100% organic cotton crib sheets. 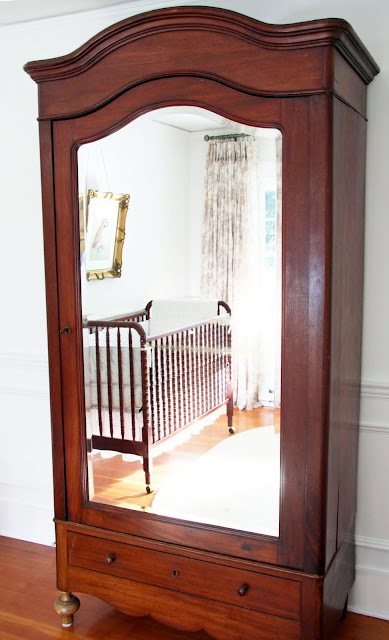 The Armoire: It was important to us to not purchase any furniture for the nursery that was made with manufactured wood, that may contain glues, adhesives or other compounds which may off-gas over time. Antique furniture provides this safeguard, as well as the opportunity to recycle beautifully-crafted pieces made long ago. Mike created shelves for the armoire using solid tongue and groove pine floor planks. My Mom then covered them in 100% cotton fabric. Nursing Chair: We selected the IKEA Jenny Lund slipcovered arm chair for nursing. I was really nervous about bringing a new chair into our nursery, as most new furniture is constructed with manufactured woods that may off-gas. So, I was happy to learn that IKEA strictly procures wood from sustainably-managed forests, and their pressed wood products comply with low formaldehyde standards. The Rug: We narrowed down our rug choices quite fast in knowing that we would only buy something that was made with natural fibers (with no rubber or plastic backing). We initially looked for 100% wool rugs, but ended up ordering a 100% jute braided rug for its style and shape. It's also reversible, so it should stand the test of time. 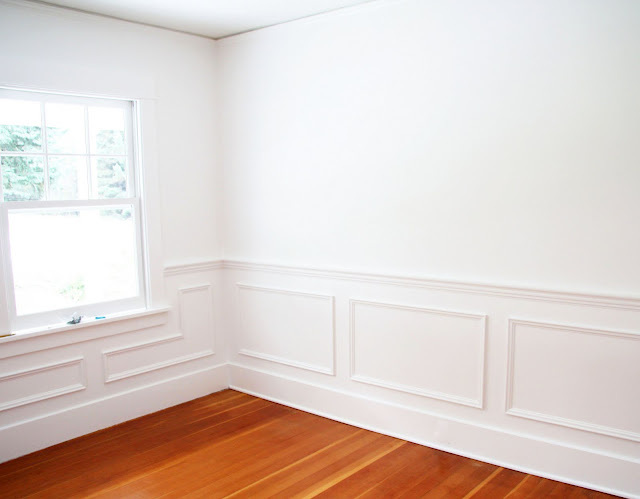 Wall Treatments: Like the rest of our house, the nursery was painted using Benjamin Moore's no-VOC line. Everything from the ceiling and the mouldings, to the doors and walls, were painted with the color Simply White in either flat or semi-gloss finishes. 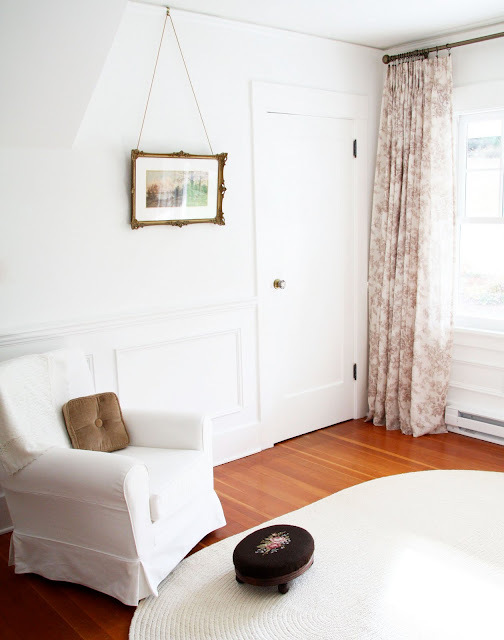 Choosing white for the plaster walls was a natural choice for me as it was the color of my childhood room, from birth until I left for college. White also has the added benefit of having less pigment added to the mix (pigments most often contain VOCs). I did just recently learn however that Benjamin Moore is one of the very few lines that uses VOC-free pigments. Thus their VOC-free line truly is VOC-free, no matter what color one chooses. 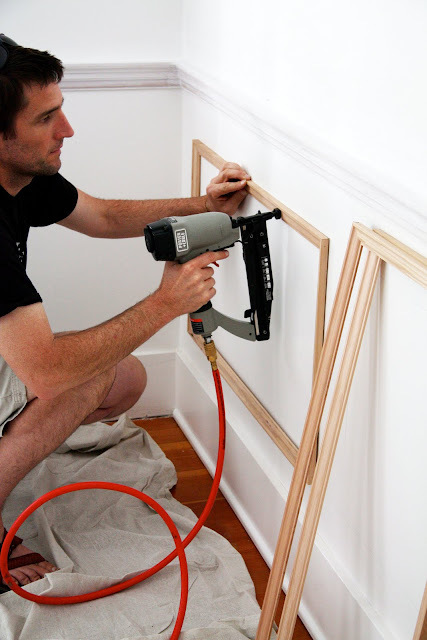 When Mike created the paneled wainscoting, he used solid wood mouldings, assembled and secured in place with a finish nail gun instead of glue. The Closet: To create extra storage, we relocated the antique dresser from the guest house. 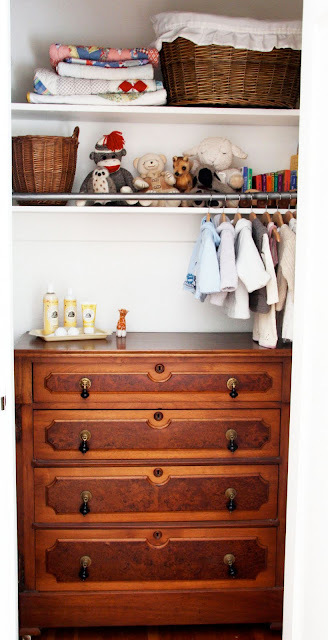 We preferred using the dresser for the same reason that we chose the antique armoire. Also in the closet are the toys and books in waiting....until the babies are older. Purchasing two cribs, two mattresses, two car seats, clothing, diapers, etc.... added up as you can imagine. So we focused our budget on the things we knew we would need from birth through the first several months. Any toys and books we have were ours from childhood, or were given to us by family and friends. When we do start buying toys, we will focus on brands that offer phthalate-, BPA- and lead-free products. 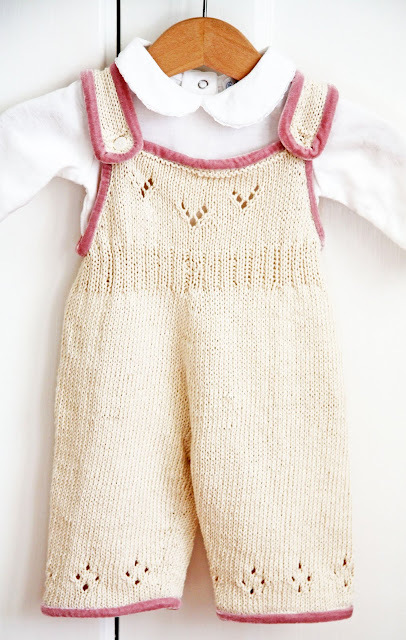 Baby clothes: We have been very lucky in that we have received lovely hand-me downs from my friend Karen, and my brother Steven and his wife Marna, who have a son and two sweet daughters. The above knit sweater was my adorable nephew's. This sweet outfit is a combination of a hand-me down (the white cotton onesie) from my niece and a purchase from a baby consignment store (the 100% organic cotton jumper with pink velvet piping). I've found consignment stores to be a wonderful resource for beautiful clothing, often hardly worn, at much lower prices than retail (organic knit jumper was $11). I hope that everyone had a lovely Thanksgiving holiday! I managed to stay on my feet long enough to make the pie crust... I spent the rest of the day on the couch nodding off and listening to the bustle of kitchen activity made by my mom and Mike. I love reading about the care and attention to each detail. Your babies will thrive in such a loving environment. Beautifully done and brilliantly said Trina, I smiled all the way through the whole post...and I'm still smiling! The thoughtfulness that went into the room of the precious babies you've both waited so long for, planned so long for, and gone through so much for, is truly inspiring...and, completely expected! The whole nursery, every detail, is the best and most good kind of an "of course" (it's about time there was a good one;) I've ever seen...perfect doesn't even describe it. You, Mike and your dear Mom have created something very special. So glad you had a nice & relaxing Thanksgiving...I'm sure your dining room was lovely! Happy first holiday meal in it! Wow this is such a beautiful space and all the more so for the thought and love that has been invested into it. You have created a beautiful safe place for your babies. You must be so proud of your achievements. It looks wonderful. Hi Trina, I have just come across your blog a couple of days ago. It is all so beautiful, thank you for sharing with us. I love the nursery it is just perfect, and I also love how much thought you put into creating such a sound environment for your babies. My baby boy was 9 months old a few days ago and he like his older brother are the result of IVF. I am so lucky to have two beautiful children and I wish you all the very best on your journey to Motherhood. the paneling looks great. i love seeing action shots! Thank you for opening up your nursery & sharing it with us - it sure is beautiful & you've done a wonderful job making sure it will be the safest possible place for your babies! All is wonderful, Trina... Have a nice week! Hi Trina, has followed your blog a long time but as you always get so many comments I haven't bother to write anything. But today I felt that I wanted to send you and your husband all my best wishes with your babies. Your nursery is perfect for the first time if you want it peacefully but I have also understood that you're a very sensible person and will create and change both this room and your house to be suitable for growing kids. Trina, I love all your efforts in creating a healthy nursery for your babies. They may not realize it yet, but they are extremely blessed to have parents like you two. Your nursery is beautiful, and you are going to be a wonderful mother. I am up now again for my baby's 4 am feeding...and although I'm dead tired, there's something special about me being the thing he needs and getting to provide that to him. I know you feel the same way....God bless and good luck in the weeks and months to come! It all is of course simply you! Wonderful! Trina...the nursery is beautiful,and the convictions that you live by are contagious. You will be a wonderful mother and your babies will have wonderfully blessed lives having the two of you as parents. Oh, the anticipation of the arrival of those precious babies! It builds with every post, it seems! Thanks for providing the background for your planning process of the nursery, Trina! When one knows and understands the provenance behind a beautiful space, I think it makes viewing the final photos even more enjoyable! So beautiful and I love the fact that you are doing the best you can when it comes to your childrens health. You can have a healthy living space that is beautiful too! Best wishes to you and your family. its all so lovely...i wish the very best for you and your little bundles of goodness. wow, those babies are going to be welcomed into a simple, ordered,clean and classic space! Maria Montessori would be so proud. I am the oldest of six kids ( with two sets of twin sisters) so I sort of know what your life is about to be like...keep resting! it is going to be a wild but wonderful ride! Thank you for all the "green" information on your nursery! It was very helpful and I'll be sure to pass it along. What have you selected for names or what names are you and Mike tossing around? Dear Trina, I read and reread your blog first thing every moring. Your style is beautiful and your blog is my favorite of all the blogs out there. I have enjoyed looking at your nursery renovations and couldn't wait for you to post them. I have been teaching young children for over 30 years, you and your hubby will be wonderful parents...enjoy them...the time goes fast. What lucky babies! Good for you for going the extra mile and creating such a beautiful and healthy environment for them. Just love what you have done! You are so lucky to be having two bundles of joy, and I am sure they will be so happy in their new room, as will you and your husband, I am sure :)! I respect tremendously that you have chosen to create such a healthy home for your family. A happy healthy start in life is a blessing we can give to our children-your committment is inspiring. Happy Thanksgiving and Congratulations!! Waiting for more great news! Your going to be such a wonderful Mother! I learned quite a bit here about green nurseries and resources, thanks so much for this post! The love and care you have put into the design and making of the nursery is evident everywhere you look! A beautiful, lovely, "green" job! That onsie with the pink velvet piping..... love it! Loved this post! My husband and I were out the other day looking at baby gear, and were caught between which crib mattress to buy (do we spend the extra cash to get the all organic, natural one, or the more name-brand "organic" option?). So many decisions. I also snagged the Jenny Lind at an insane price ($99 at CSN right now!) and couldn't be happier. 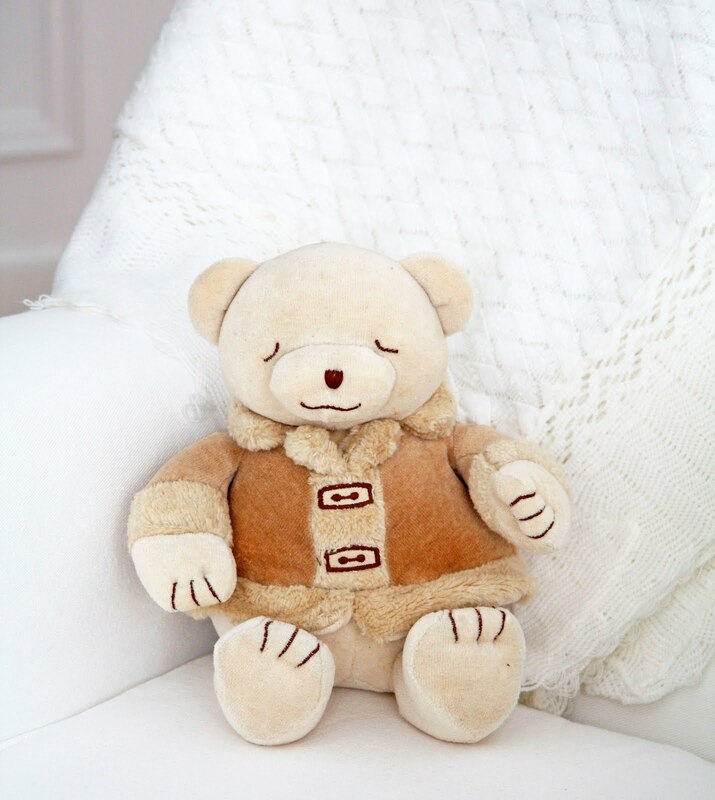 You may know of it already but have a look at www.oompa.com They have lots of great babies/kids toys (I love all the old-fashioned wooden toys myself) plus an entire organic/eco-friendly section. Your nursery is quite lovely, as is your blog. I wish good health and happiness to your family. I want to tell you of some beautiful non acrylic wall paints. Four wonderful sources come to mind, www.annasova.com, www.bioshieldpaint.com, www.milkpaint.com, and www.solventfreepaint.com. 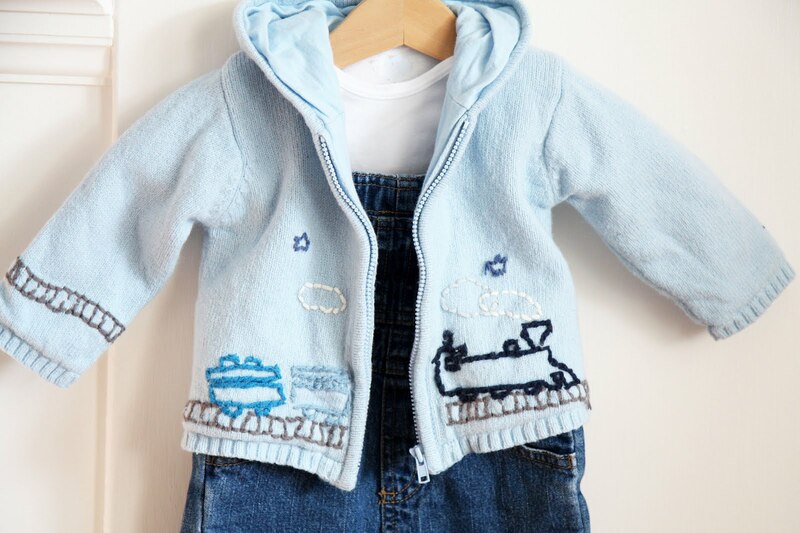 A great source for children's toys is www.moolka.com. Oh, I love your blog and nursery. I think it's so important to make it green. Those babies are so lucky to have parents like you! I am a fairly new grandmother to a 2 yrs old and a 3 month old and have followed you since the announcement. Can't wait til they are here! Think I could babysit online? What a beautiful nursery! And, it will be even more beautiful when those babies are in there. Great tips on the paint and decor that can be incorporated in any room in the home. Enjoy these last couple of weeks! I can tell that your children will be embraced by the easy surroundings provided by you, your husband and mom. I can image a lot of books, not constant TV noises; I can see hours of strolling outside the house in nature, not busy indoors overwhelmed by toys. They will learn early on that joy of life is from within, from appreciating the few treasures they already have, not from desires fulfilled by the latest iPod, not from installing a new marble counter top (not entirely at least). Such care for these babies. I know they are truly loved and wanted. If only every child in the world could be born into a situation like these two . I am so amazed at how thoughtful and beautiful your home is. Everything is so bright and fresh. Thank you for sharing. Gorgeous, healthy...and full of love. No better way to be welcomed into this beautiful world! It's just gorgeous. I love your style. I am sure you are anxious to meet your little darlings. Good luck with everything! great place for the twins, not only for optical reasons. two cribs? hope you will let the two little darlings together in one crib until it gets to tight or they separate from each other by their own will and strength.... all the best for your last few weeks! my english is so bad, sorry, of course i meant the last few weeks of pregenancy (and just realized it sounded weird) anyway: happy next few weeks! Hi Trina! Absolutely amazing job!!! I am so impressed with how "green" you kept the nursery...a must at our home as well! Great job, it all looks beautiful!! I am going to pass this link along to my sister who is pregnant for the first time as there is so much wonderful information here, so thank you for that!!! Having two children myself, I can say that you have a genius and a beautiful nursery. I think that chair will be your space to bond with your little ones. That's how I look at my nursing chair! I am very invested in having a healthy home as well, and tend to look for the same things as you (no off-gassing, etc.) We have that crib mattress and have been very happy with it. When the time comes to look for baby/kid toys and crafts I have found Nova Naturals to be great. The nursery looks fantastic! Hi Trina, I was so impressed with this post! Your baby will certainly live in a safe and loving home - what a lucky little one! Ciao, bella! 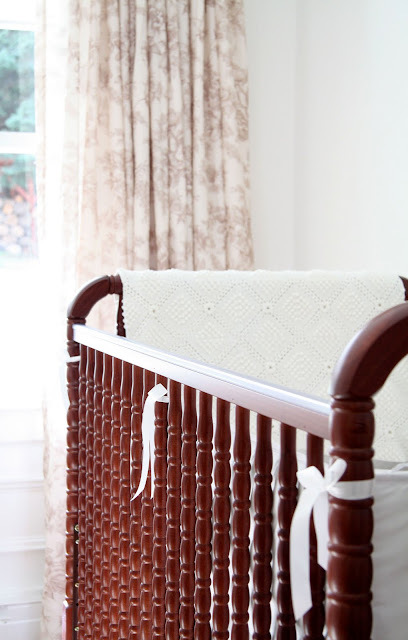 Your nursery is just beautiful (as is the rest of your home). I have a question--your pictures are always so beautiful, what type of camera do you use? You have made so many beautiful choices and clearly put so much love into it! Truly a room filled with thoughtfulness and love. I'm SO excited for you. Can't wait to find out what you name your little ones !! I'm so glad you shared with us! Everything is beautiful! The nursery is lovely, and safe! Perfect for a baby! Hi! Congratulations on your babies, I'm so happy for you guys! I'm a faithful follower (since just this past August) but have never commented (for some reason I'm shy even tho anonymous!). I enjoy reading your posts & am amazed at your house remodel. Your pictures are always lovely! I think I read that you use the lowest version of Photoshop, is that the one for beginners? Not the one you need to take a class to use? P.S. I made your pumpkin cake & it was DIVINE! P.P.S. I admired your kind responses to the nit-picky mothers... I thought their words to be a bit harsh & inconsiderate of how you shared something as personal as your beautiful new nursery. I'm having a little boy in April and this post makes my heart happy! thanks for sharing! Yes, Photoshop Elements is the most basic version. I did take a one day class but it wasn't very helpful to me. The class focused on special effects and I was most interested in basic color and lighting quality. The pictures are hung on the original picture rail mouldings. The cords are weaved wires covered in fabric. For added safety, we also hung them by picture hooks on the plaster walls. This is unnecessary usually but since they were in the nursery, we wanted to be 150% sure that they were extra secure. So happy that you liked the pumpkin cake!! I was just mentioning to my husband that it would be fun to do pumpkin birthday cakes for the babies when they're older. I thought it would be fun for them to watch their 'birthday' pumpkins grow. VERY impressive. What a lovely environment you have created for your little one! Just lovely! Your nursery is beautiful. Congratulations. When I was designing my nursery, I too used antique pieces, including a collection of antique toys for display. I find it so profound to use heirloom pieces or pieces that carry with them such history and warmth in creating a home for your family. It is inspiring to see you doing the same. There's nothing better than finding* a new blog that you just know you're going to go back and read from Day 1. I can't wait to read about your babies. I'm so excited for you. Everything ready, and I am getting so excited to hear your news. Like you,we had quite a struggle to produce a family, but now have two marvelous, grownup daughters. The best thing in the world! Wishing you and your babies a smooth, safe arrival. You give my SO much inspiration! I love all you do!!!!! COngrats on the new babies to come! So exciting!!! I love the chair from Ikea...I'm also looking for something similar, but would love one that swivels/glides (like from Pottery Barn...but not at that price). Do you have any suggestions??? I also just love love love your nursery. We just relocated and are staying with my parents, so my ability to nest relies on what my parents will let me do. :) I'm also an older first time mom...and can't believe how blessed I am. We are. So, so lovely and soothing. I've always loved white and somehow let the trend of 'if a room's white it's not done' influence some of my rooms. Well your home has re-inspired me! 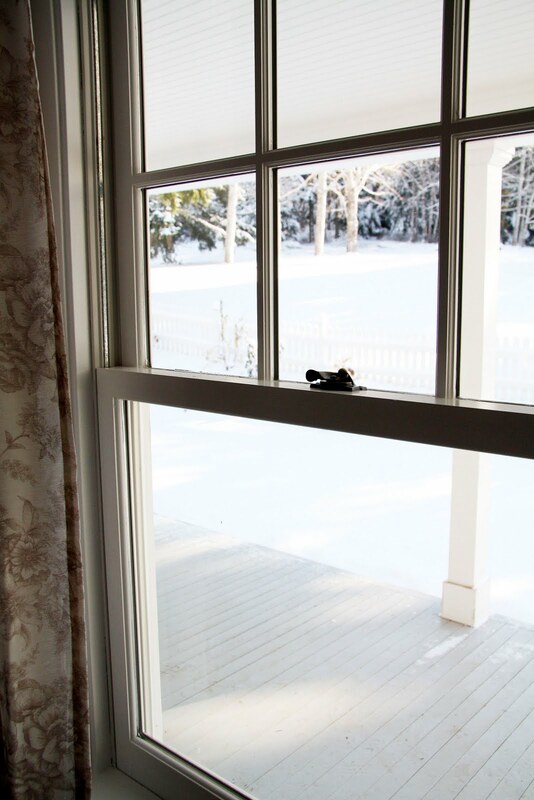 Your babies are coming home to a lovely, homey room. How is it you make your home as beautiful as a magazine cover, while keeping it so simple, humble and green? Also, many congrats on your babies! P.S. The mom in me is making me let you know I had a stand swivel mirror in my own closet that my third baby son, hit with a wooden train track and broke (I was right there-so no injuries! ), so take care with the (gorgeous) armoire mirror. your nursry is lovely. I'm guessing baby arrived?? I hope you are well and happy holidays! Congratulations on your sweet babies, Trina. :) I have been checking in on your blog for some time now, but have never commented before. I only do so now because of something I feel compelled to mention. I also have many antiques in my home...dressers, tables, and bookcases to name just a few. But having three young children (ages 9, 7, and 5) has taught me a lesson about decorating with these items: make sure to bolt those heavy and tall pieces to the wall. It is amazing what kids will do when your back is turned for even one moment. I hate to be the person with a "downer" posting here on your lovely blog, but I just felt led to tell you about this often over-looked safety feature. Too often we concentrate on making the nursery "safe" on the surface for our dear babies...covering outlets, choosing paint with no fumes, and carefully putting breakable objects out of reach. Unfortunately we forget that these solid pieces of furniture can be very dangerous for a small child, something a blogging friend of mine recently found out in a most heartbreaking way (warning: difficult to read, but oh so important for us mothers and fathers to know about: http://networkedblogs.com/bSh74). I just don't want this to happen to anyone else so I thought I would take a moment to post this information so your beautiful family never has to experience a preventable tragedy like this one was. Hi Trina! I'm expecting my 3rd this summer & was wondering where you purchased your organic crib bedding from, particularly the white crib bumper. 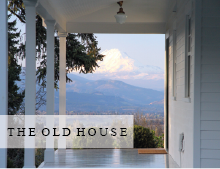 Your home is so beautiful & inviting! Just the crib sheet is organic (and the mattress). The bumper and skirt were not but I soaked them in vinegar for quite awhile to cleanse cotton of chemicals. Even so, I never did use the bumper once the babies were born. The skirt, since they couldn't touch it, was used. The sheets were purchased at Diapers.com, although I can't remember the brand. I have bought several and they are all so different in fit and quality. Thanks so much for responding to my previous comment! Do you mind me asking where you got the bumper, even if it's not organic? I've had such a hard time finding simple, clean, white nursery bedding (that doesn't cost a fortune either)! Best wishes on your upcoming move, by the way! So glad that you're going to continue to blog & that you're allowing us, your readers, to follow along on this new stage in your life! I found the white bumpers and crib skirt on Diapers.com. I looked everywhere and it was the only place I could find that sold plain white. Hopefully, they still sell them!